Our newly renovated, spacious 22-table, non-smoking poker room is a guaranteed winner. To add your name to a wait list or to confirm the tournament schedule, please call the Poker Room at 269.660.5631. After the first hand of a new game, players may buy up to the largest stack if that stack is greater than $500. $2 – $10 SPREAD LIMIT! See the Poker Room for complete details. Management reserves all rights. Each qualification period up to 90 players will compete in a $6,500 Guaranteed Tournament. 1st and 2nd place will win $1,500 in CASH and a seat in the $55,000 Grand Finale Event! First and second place will each receive $1,500 and a seat in the $55,000 Grand Finale Event! First place $20,000 minimum guaranteed! TOC is a point system competition in which tournament players accumulate points when placing in any regularly scheduled poker tournament. Points are calculated as follows: total number of entrants multiplied by the amount of the buy-in; divided by the payout position plus one. Points will be based on the number of payouts for each tournament. Each tournament will fall into a pre-determined group based on buy-in amount. Each group will have a maximum number of players eligible to advance to the quarterly and Grand Finale event. A total of ninety (90) players will play in each quarterly event. 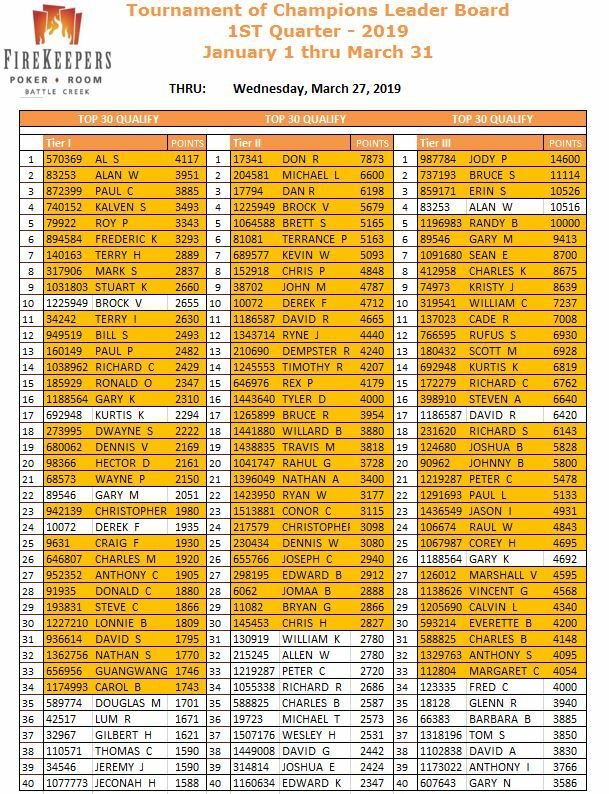 •A total of 30 players with the highest accumulated TOC points will play in the quarterly tournament based on a tournament buy-in of $40. •A total of 30 players with the highest accumulated TOC points will play in the quarterly tournament based on a tournament buy-in of $45 up to $85. •A total of 30 players with the highest accumulated TOC points will play in the quarterly tournament based on a tournament buy-in of $90 up to $250. 5% of the player prize pool of all regularly scheduled tournaments will be withheld to fund the TOC promotion. TOC seats are not transferable. Any qualified player who has not taken a hand by the start of the fourth level will be considered a “no show.” These participants will have their chips removed from play and will not be eligible to participate in the event. $350 = 20,000 starting chips with 30-minute levels and 1 re-entry through the 4th level. Registration opens April 21st, 2019. Registration opens two hours prior to each tournament. Sunday, April 28 at 12pm – Registration opens April 21st, 2019. TDA rules apply. One re-entry available for all tournaments with a $60 or more buy-in. Must be a Red Hot Rewards Club member. Visit the Poker Room inside FireKeepers Casino Hotel for complete details or call 269.660.5631. Management reserves all rights. Download the guide to the games you would like to learn, then come test your luck in our poker room. 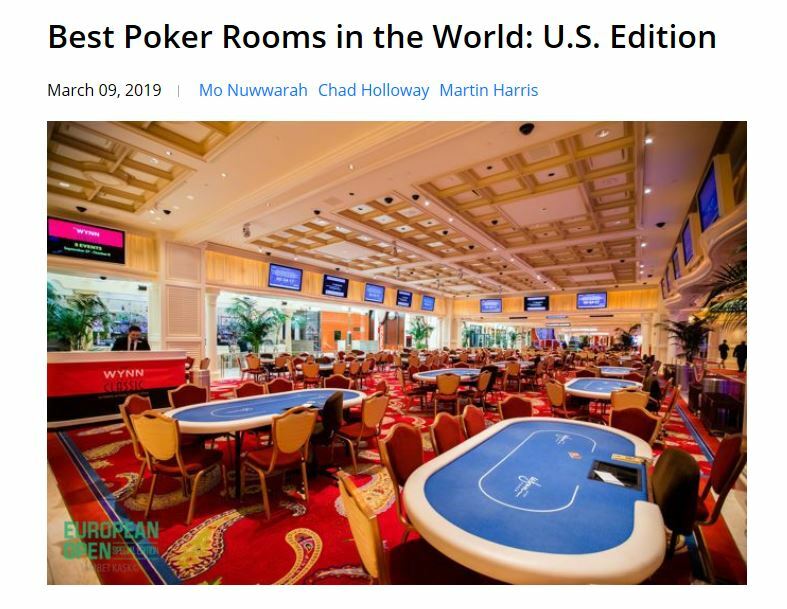 Poker News names FireKeepers Poker Room one of its Best Poker Rooms in the US! Congratulations to the Poker Room Team!